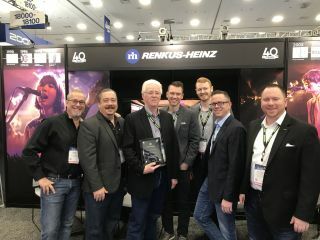 At this year's NAMM Convention, Renkus-Heinz recognized its leading manufacturer's representatives for top sales and outstanding achievements. "Hearty congratulations to all our rep firms," said Joe Fustolo, Renkus-Heinz Eastern Regional Sales Manager. "Their entire crew are top-notch—talented people who really understand the technology, and genuinely great guys who know how to treat their customers." We're truly honored to be recognized as Rep of the Year by Renkus-Heinz," said Gene Williams, Frequency Sales founder and president. "The company has long been a leader in loudspeaker technology, and we've recommended their products in a great many challenging projects. It's not hard to sell a great product, and Renkus-Heinz makes it easy for us." "Renkus-Heinz has a long history as one of the legendary names in our industry," added Michael Austin of Native Media. "Their products have been a go-to solution for our customers. We're proud to represent them and appreciate this recognition."